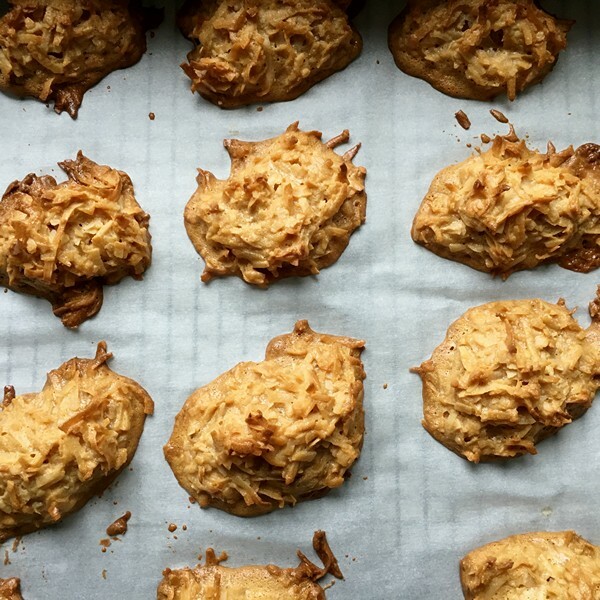 My friend Leslie makes these coconut macaroons all the time. 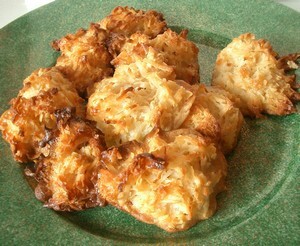 She introduced these to me and when I found out how easy they were, I demanded the recipe. It’s better if you remember to take the eggs out ahead of time, but they’ll be fine either way. Dipping them in chocolate is so unnecessary but so good! Takes about 45 minutes, mostly baking time and makes 20 to 22 cookies. Drop the batter onto sheet pans lined with parchment paper using either a 1 3/4″ diameter ice cream scoop, or 2 teaspoons. Bake for 25 to 30 minutes, until golden brown. Cool and serve. To coat them with chocolate: Melt about 4 ounces of good quality bittersweet chocolate in a double boiler, or on a plate in a microwave in 30 second blasts. 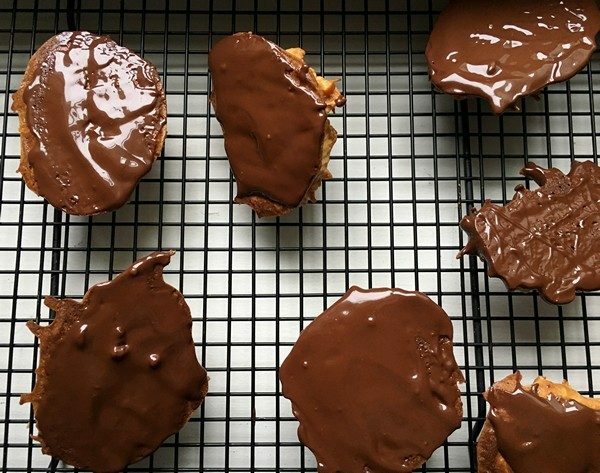 When the chocolate is melted dip the macaroons in the chocolate, or paint the bottoms with chocolate, let the excess drip off into the pan. Place on a wire rack over a cookie sheet, or on a sheet of wax paper or parchment paper to cool. Enjoy! My verdict: It’s always amazing how something so simple can be so good! Adding the chocolate isn’t necessary but it makes them even better, so why not? If you ever need a quick dessert to bring to something, this is it. Save the extra yolks and use for mayo or hollandaise sauce. Yes, too easy to have all ingredients on hand and make! But delicious!!! fan-bloody-tasket….never heard of such.goodies,and almost too easy to make; bravo!! I want those right now. They are gorgeous. Nice work, Ann. I adore macaroons! Especially because they’re gluten free. I’ve never been much of a baker, but these seem really easy. HUGE thanks for reminding us about the extra yolks! These look great. If you don’t want to make—go to Gracie’s in Providence, RI. When you valet park your car–they leave a scrumptious one on your seat for the ride home. Accidental Locavore: Blogging Boomer’s Carnival 250!